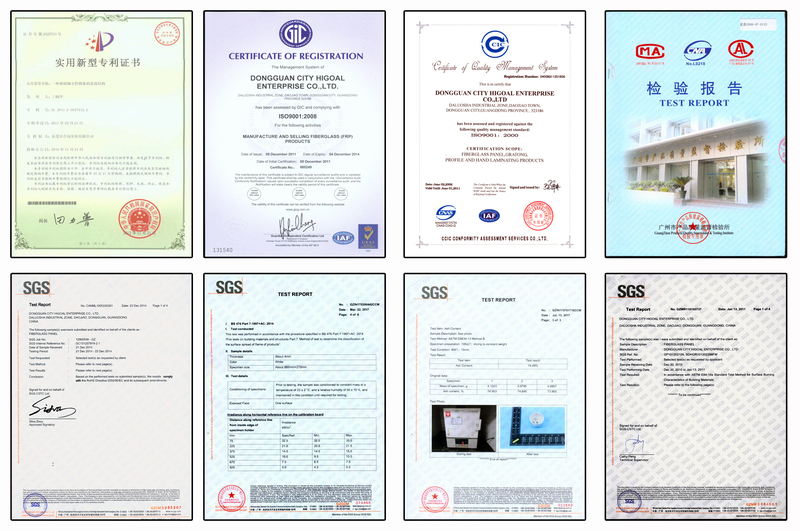 Higoal FRP was established in Dongguan City in May 1995, as a technology enterprise in composite application field, professional in manufacturing, developing and marketing high-quality fiberglass products. With self-built industrial zone in 2005, Higoal FRP has become the biggest manufacturer of fiberglass panel, biggest exporter of fiberglass grating in Southeast China, also a supplier of total solution for anti-corrosion construction. Total Solutions from Concept to Completion! Welcome your Inquiry Established in Dongguan City in May 1995, Higoal FRP is as a technology enterprise in composite application field, dedicated to manufacturing, developing and marketing high-quality fiberglass products. As pioneer in Chinese composite field, Higoal is more than an unitary manufacturer on FRP products, but a total solution provider for anti-corrosion of industrial building. Higoal started manufacturing FRP panel since 1996, and up to now, which has been upgraded for six generations. 23-year production experience and technology accumulation, and continuous quality improvement, endue Higoal with good reputation on FRP panel. For over two decades, Higoal engineers have been constantly improving the aging problem of FRP skylight panels. Through repeated experiments with tracking the products used since Nov. 2013, finally, the proud sixth-generation FRP skylight panel came into being, and achieved the mass production. Higoal FRP skylight panel is coated with 250um gel coating, which is iso-phthalic unsaturated polyesters. It greatly enhances FRP panel weathering resistance. Through many specialized tests, Hi-goal engineers believe that fundamentally solves the problem of FRP fiber exposure. As a mature one-stop supplier on building material for highly-corrosive industrial plants, we not only produce anti-corrosion building material, but also provide total solution according to different temperature, humidity, acid and alkali of the different corrosive conditions. FRP anti-corrosive building material covers: FRP roofing sheet, FRP wall panel, FRP gutter, FRP purlin. Among, Higoal have been obtained a number of patents for continuously pultruded FRP gutter and purlin. Higoal is the largest manufacturer and exporter on FRP grating in Southeast China. Higoal FRP grating is of the advantages of acid & alkali resistance, skid resistance, and weight bearing, is applied in highly corrosive, hot-humid and rusty area, such as paper mills, chemicals workshops, sewage treatment plant, car washing shops, marine platforms and other location. FRP grating is generally used as drain cover, platform, anti-skid walkway, stairs and so on. FRP flat panels are the products Higoal have invested greatly to develop recently years, at the max width of 3000mm. They are common lining flat panel, pebbled texture panel, and gel-coating flat panel, with characteristics of light weight, high strength, anti scratch, environmental protection, energy saving, non-toxic, moisture-proof, anti mildew, easy cleaning, etc. Higoal FRP flat panels are widely used on shelter, truck, refrigerator, portable house, food plant, hospital, supermarket, cold storage as wall skin or ceiling panel. Up to today, Higoal FRP products have been exported to over 50 countries and regions all around the world. Higoal is experienced to produce large and complex sectional profile. Higoal pultrusion profiles include structural member, platform, H-beam, rod, pope, channel, angel, flat beam, square tube, complex profile, and customized profile, mainly used in light industry, construction platform, handrail, walkway, and electronic products fields and so on. Higoal FRP pultrusion profile is of the advantages of light weight, corrosion resistance, insulation, heat protection, free-maintance, large span, etc. Higoal owns both advantages of mature technology and competitive price. The design, production and quality service system of international standard, the price of localization and the punctual delivery, enable Higoal and customers develop into a mutually beneficial system.